If you had to estimate…realistically speaking… how far off are we from walking into a clinic bald and walking out with a full head of our own hair ? 5 years? 10 years ? 15? or 50? I’m asking those who keep on top of all this scientific stuff, so if you are a lay person PLEASE do not chime in with a number you dreamed up because its a messing up the estimate. » 5 years? 10 years ? 15? or 50? » because its a messing up the estimate. Science is a very slow process. Just look at Follica, they made a novel discovery back in 2005-06 how to create new hair follicles and five years later they still are in preclinical trials and haven´t started their human trials (and human clinical trials take about 10 years). Also the concept of HM has been around for what, 15-20 years, and we have a company doing phase 2 clinical trials today. So, best case scenario, they make a huge breaktrough tomorrow and putting all the pieces together. Now they need a couple of years of preclinical trials to see it is safe and effective enough to test on humans. Lets say five years. And then we have the clinical trials on human. 10 years. So in the best case scenario people would be able to get a full head of hair in 15 years. More likely science will build on previous discovery and knowledge and slowly solwing the puzzle in the next 10-15 years. And then you have the preclinical and human testings resulting in a “baldness cure” on the market in 25-30 years. 10 years, 265 days, 3 hours, 46 minutes and approximatively 7 seconds. … I’m pretty sure that ARI WILL try completely the same – DEPENDING ON THE OUTCOME OF THE ONGOING PHASE II TRAILS! 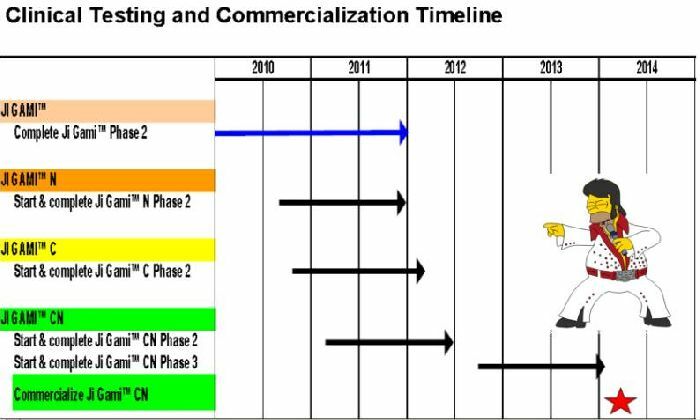 That means, IF the ongoing Phase II trails are successful, there might be the possibility for a “small scale commercialization” in 2 years (about 1.5 years earlier than estimated by ARI). that will never happen! not with ht. that will happen if anyone will develope a gene therapy. so basically there’s no chance of a cure in the next 5 years is what I’m hearing. that’s sad to say the least. where will you be in 20 years and will it matter ? » that’s sad to say the least. » where will you be in 20 years and will it matter ? Where the hell did you mention the term “cure” in your initial post ?? A cure is anything that will restore a full head of hair to a bald person. This would have to be his own head hair. No point making a circus of a simple subject. We’ll know the cure when we see it! I think Aderans probably offers the best glimmer of hope (however small) that we may see a miracle in the next 3 to 5 years. But imagine the rush if they actually did succeed. You’d be on a 15 year waiting list. still funny & ya iron man I regret saying anything good about rassman he’s definitely con w/ the acell bs… But deep down I don’t really give a f wat any says about me on here. Aderans and Histogen both seem to have the potential to release something real by 2013-2015. I’m speaking of the Asian market. I assume if you’re as serious about this stuff as most of us are, you’ll get the plane ticket without batting an eye. For the American FDA I might estimate most of a decade from now, barring further problems. ARI is closer than Histogen, especially where the FDA is concerned. But Histogen seems pretty likely to work and IMHO it seems to be a more simple elegant solution than ARI. hehe, i am still laughin at you, poor guy!!! you want to be the wise owl of the forum but you are way too dum.b to pizz a hole in the snow. btw: it is not allowed for pedos to post at the german forum. I am still there but…why are you banned??? » …why are you banned??? Because I banned myself - like many others did. You wrote clearly “is not easy …” (you didn’t wrote “it must be” or something like that) and reinforced your statement with four –no, not just with one or two- with four “!”. Both CLEARLY indicates, that you KNOW that IT IS “not easy to handle”. So I ask you the third time: WHY do you know that with such a great certainness?